One of the goals of the Lucasfilm Story Group, created by Kathleen Kennedy after she became the company’s president, is to explore the opportunities for Star Wars in the new forms of storytelling emerging as our entertainment and experiential technology rapidly advances. Films, television, books, and comics aren’t going away any time soon, but none of them provides the degree of interactivity and immersion made possible by augmented reality and virtual reality. 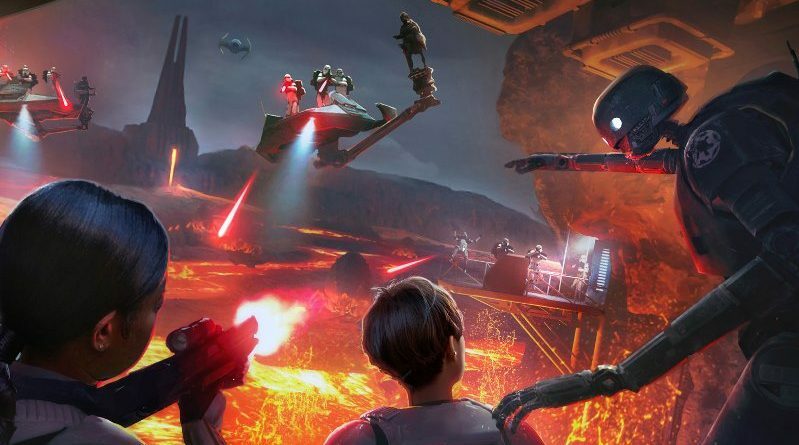 The newest Star Wars VR experience is Secrets of the Empire, a collaboration between ILMxLAB and THE VOID. Announced in early August, it shared its opening weekend with the theatrical release of The Last Jedi and is currently available in three locations worldwide: Disney Springs in Florida, Downtown Disney in California, and the Westfield mall in London. The FANgirl team joined the Rebellion to undertake the mission on Saturday, December 16, 2017. At Star Wars Celebration London in July 2016 we had participated in Trials on Tatooine, the previous ILMxLAB virtual reality experience. In all ways, Secrets of the Empire expands the use of VR to tell a Star Wars story. Fans entered the Trials on Tatooine individually, one at a time; Secrets of the Empire is a team experience for a group of four. Trials on Tatooine is rather brief, lasting only a few minutes; Secrets of the Empire is closer to half an hour in length from start to finish, with about half of that immersed in the virtual world. The events of Trials on Tatooine were linear, with each participant experiencing essentially the same thing, while Secrets of the Empire unfolds with more prongs in the decision tree to make the experience more interactive and more interesting to repeat. Perhaps the biggest difference is the scope of the experience. With a headset and earphones tethered to the gaming console generating the VR, participants in Trials on Tatooine could turn and look in any direction but were functionally immobile within the VR room. Likewise, while the visuals and audio were well done, the stationary experience felt more like temporarily visiting the Star Wars galaxy than actually entering it. In Secrets of the Empire, on the other hand, participants don not only the VR headgear, but also a full torso rig to carry the necessary computing power with them. This allows the participants a full range of motion and mobility, including walking through different rooms of THE VOID’s facility. In addition to sight and sound, the gear also enables a more immersive experience, including temperature differences between starship interiors and outdoor environments and the sensation of armor being struck by blaster bolts. In that respect, Secrets of the Empire definitely offers a heightened immersive experience for Star Wars fans. The objective of ILMxLAB’s projects, though, is not simply immersion in the Star Wars galaxy, but inside a Star Wars narrative. Secrets of the Empire begins the story in a ready room prior to donning the VR gear. The team of four receives a mission briefing from Cassian Andor, in a video clip of Diego Luna reprising his role from Rogue One, explaining the undercover operation that the Rebellion’s intelligence division needs the team to carry out. After gearing up, the VR experience begins. During the mission, K2-SO offers ongoing instructions and explanations with a tone and candor very much in character to the movie. When the experience ends, the team has learned some of the answers Rebel Intelligence wanted, but also leaves with more questions about what the Empire is hiding. Many of the details of Secrets of the Empire will catch the attention of Star Wars fans. 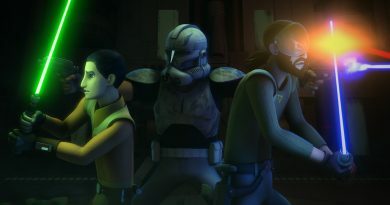 Though prior materials had associated Cassian with the Rebellion codename Fulcrum, fans of Star Wars Rebels will immediately recognize the emblem that marks his transmissions to the team. A return to Mustafar is always visually stunning, and the lava fleas seen in the background in Revenge of the Sith become a lot more menacing up close. Going undercover in stormtrooper armor also elicits a smile from those who are “a little short” for the Imperial military’s usual specifications. While it is a step up in VR quality, Secrets of the Empire has room for improvement, too. The environment within the experience was a bit claustrophobic a times; a somewhat more spacious setting, allowing the participants to stand further apart rather than huddle in a clump, would help. The tracking of the blaster rifles’ aim could be frustratingly inaccurate, undermining the thrill of engaging in Star Wars combat. The underlying narrative of Secrets of the Empire also could be strengthened. The connection to Rogue One feels tenuous, if not contrived, when nothing about the undercover mission has any apparent connection to the secret Death Star project or the events of the film. Instead, we took away the impression that the stormtrooper armor and Imperial base had been designed for a different narrative – perhaps the seemingly defunct Darth Vader story by David Goyer – and then repurposed for this one to avoid the development time and effort going to waste. We left Secrets of the Empire with no indication of how the mission contained in its narrative is meant to relate to other Rebellion-era stories. Without that, Secrets of the Empire becomes another cool VR one-off like Trials of Tatooine, rather than an interconnected segment of the overarching Star Wars narrative of the Rebellion’s struggle to restore freedom to the galaxy. Overall, though, Secrets of the Empire is worth the experience for fans enchanted by the idea of entering the Star Wars galaxy. The immersiveness is substantially greater than Trials on Tatooine, and for many fans that may more than compensate for the weaknesses in the narrative. Even the in-universe immersion of the upcoming Galaxy’s Edge theme park lands will have its limits, of course. If you’ve ever wanted to gun down stormtroopers with a rifle in your hands, not just a videogame controller, Secrets of the Empire can make your childhood play come to life. For more on Secrets of the Empire, Tricia talks about her experience on the latest episode of Skywalking Through Neverland.